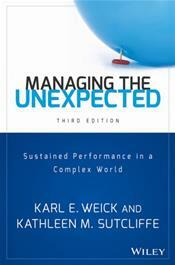 Managing the Unexpected, Third Edition is a thoroughly revised text that offers an updated look at the groundbreaking ideas explored in the first and second editions. Revised to reflect events emblematic of the unique challenges that organizations have faced in recent years, including bank failures, intelligence failures, quality failures, and other organizational misfortunes, often sparked by organizational actions, this critical book focuses on why some organizations are better able to sustain high performance in the face of unanticipated change. High reliability organizations (HROs), including commercial aviation, emergency rooms, aircraft carrier flight operations, and firefighting units, are looked to as models of exceptional organizational preparedness. This essential text explains the development of unexpected events and guides you in improving your organization for more reliable performance. "Expect the unexpected" is a popular mantra for a reason: it's rooted in experience. Since the dawn of civilization, organizations have been rocked by natural disasters, civil unrest, international conflict, and other unexpected crises that impact their ability to function. Understanding how to maintain function when catastrophe strikes is key to keeping your organization afloat.